You may or may not know that I recently worked on two craft books (for kids aged 6-12) via Studio Fun (formerly Reader’s Digest Children’s Publications) and one of the books is all about duct tape projects! They will both be released in the fall, but I wanted to share something using duct tape that’s super easy and really fun. You can make beads in just a few minutes, and I will show you how. Mardi Gras will be here before you know it. This year it’s on March 4th. So make these adorable necklaces and bracelets to celebrate! Note: A self healing cutting mat is a must when working with duct tape! Not sure when Mardi Gras is? The date changes each year and is dependent on the date of Easter. You can visit the Mardi Gras New Orleans website to find out the date for Mardi Gras each year. 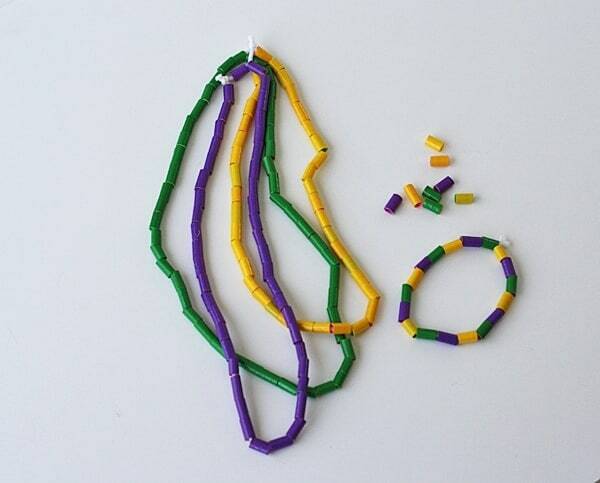 Here's a fun fact: The colors of Mardi Gras have meaning and were chosen way back in 1892! Purple represents justice, green represents faith and gold represents power. 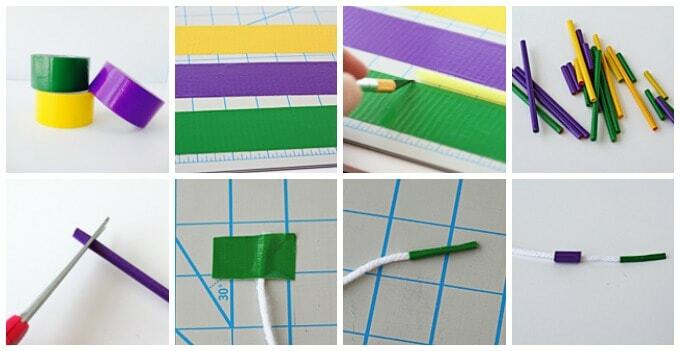 Measure out one strip of each color duct tape on your cutting mat. Cut the strips in half lengthwise so that you have two long strips for each color. Now cut the strips of tape to match the length of your drinking straws. Place a straw on the edge of the tape and roll it up, covering the straw completely. 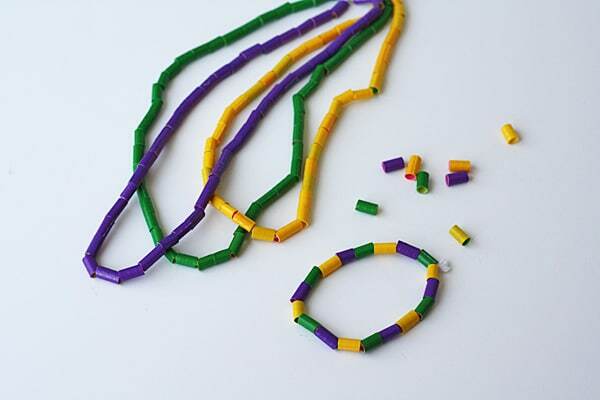 Use scissors to trim the ends off of each straw, then cut them into whatever lengths you want your beads to be. Cut a long length of yarn, long enough to make several necklaces to fit your child. Use a piece of tape to hold one end of the yarn down on the cutting mat so that the beads do not fall off the other end when you string them on. Wrap the opposite end of the yarn with a piece of tape to make it easier to string the beads on. Thread beads onto the yarn string, making the necklace as long or as short as you like. When finished, cut and tie off. You can use all one color on each necklace like traditional Mardi Gras beads, or use multiple colors, whatever your preference! A self healing cutting mat is a must for anyone who plans to make duct tape projects on a regular basis. While it's not required, it makes working with the tape a lot easier! I like this helpful n interesting way.